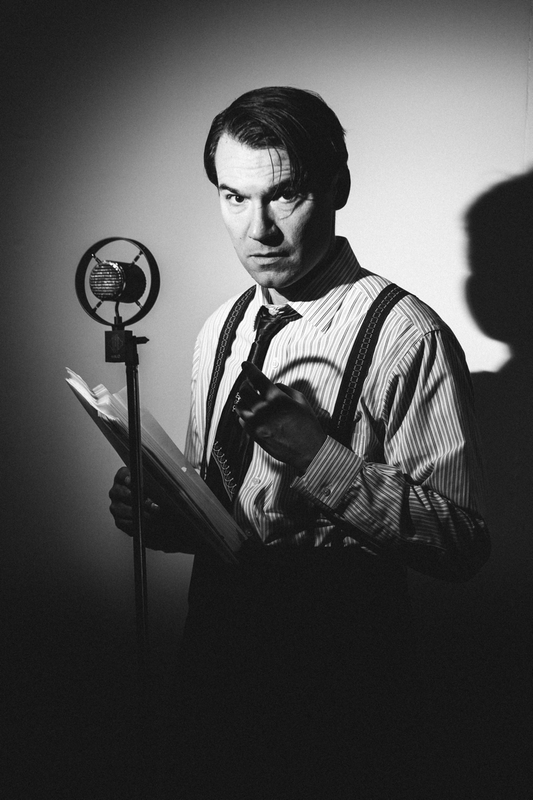 In homage to radio dramas of the 40s and 50s, Radio Hitchcock is a delightful production from 34 West Theater Co., full of intrigue, suspense, and rambunctious humor. Written by Stephen Wayne and Jeff Querin (34 West co-founders), the story is set up in a similar fashion to the old radio dramas; a normal person is suddenly thrust into a dangerous or bizarre situation. In this case, our heroine Josephine (wonderfully portrayed by Kristen Kos, making her 34 West debut) is given an envelope by a frantic man claiming, “They’re after me. You’re our only hope,” as he is struck dead by a passing bus. Chaos, calamity, and whimsy ensue. In addition to writing the play, Wayne and Querin round out the three-person cast, portraying a host of ridiculous characters along the way. Highlights include a strange motel proprietor with mommy issues, a pair of Cockney cops rife with buffoonery, and a budding writer of bad suspense stories named Alfred. The script is fast-paced and brimming with wit and parody. Nearly every Hitchcock film is lampooned and the laughs never let up. Sight gags, including inventive use of the limited props, add to the chuckles and the sound design is truly inspired, not only in setting the mood but also in augmenting the hilarity (notice the impeccable timing required of the players!). The venue is ideal in its ambiance and intimacy. The viewer can’t help but feel involved as the actors adeptly maneuver the grounds, weaving between audience members and occasionally interacting with them. The result is a fun, top-shelf production that is as innovative as it is enjoyable. If you haven’t stopped in for a show at 34 West, do yourself a favor and set a date. Radio Hitchcock runs through November 15th. Posted on October 15, 2015 by admin.